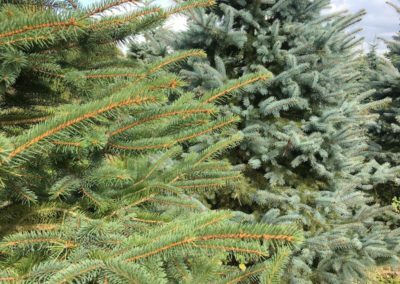  Tree guides: Norway Spruce, Nordman Fir, Blue Spruce ...more coming soon! 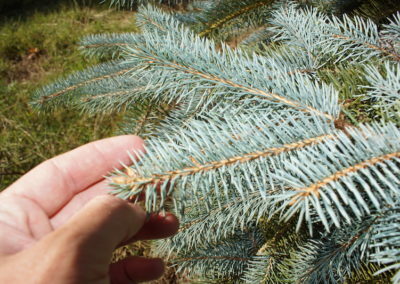 The Blue Spruce (邏 Picea Pungens) is for life, not just for Christmas. By that we mean it’s a pretty popular tree amongst keen gardeners the world over. 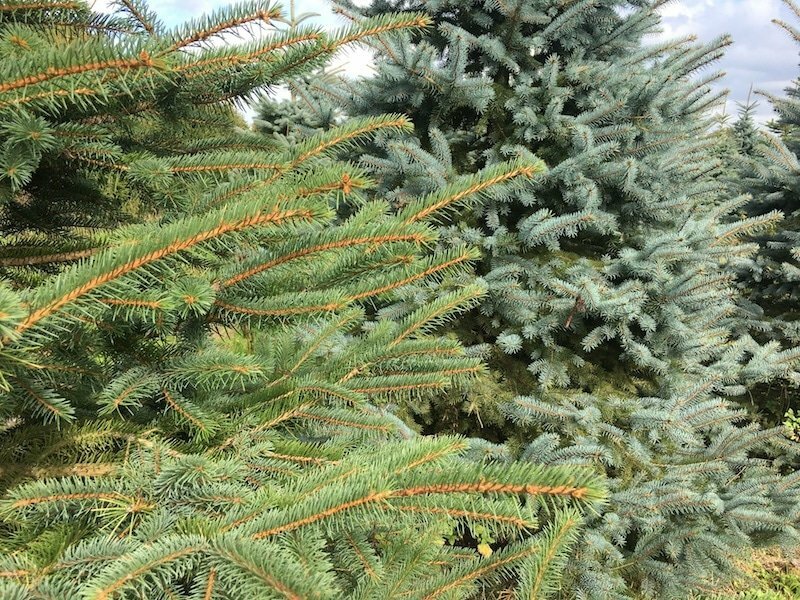 Also called the Colorado Blue Spruce, this tree hails from over the pond; it’s native to the Rocky Mountains and grows naturally in New Mexico, Colorado, Utah, Wyoming and Montana. Unless you call those fine states home, you’ll most likely have seen it growing as an ornamental tree in parks or gardens. You might’ve guessed that the needles on this tree have a blue-ish colour. We say blue-ish because the colour can vary a fair amount; some trees will have a striking blue appearance, some are more silvery-blue, some bluey-green and some much more green with a hint of blueness. You’ll see in the gallery below two examples growing side by side that have fairly different colours. It’s Latin name, Picea Pungens, might make you think it’s named for it’s strong smell. If so, tut tut, you need to brush up on your Latin. 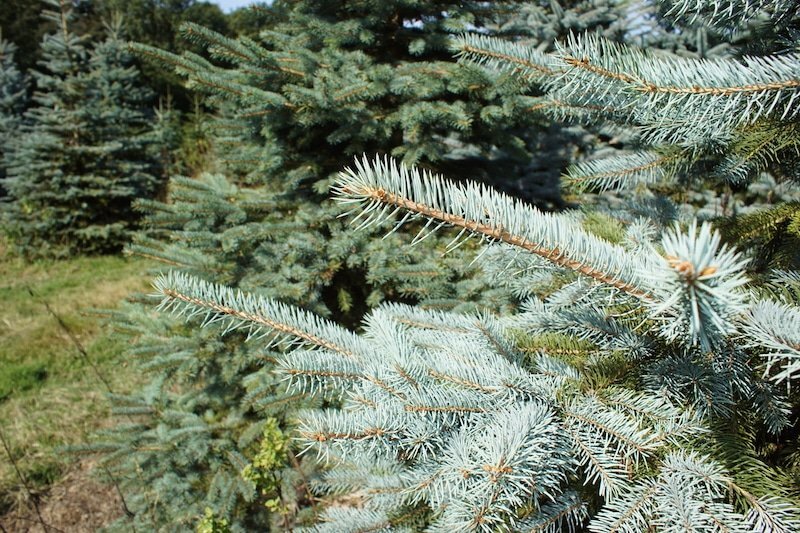 Pungens actually means ‘pricking’ or ‘puncturing’, and it’s a pretty apt name – the needles on a Blue Spruce are extremely sharp. Even Farmer Tom, with hands tough and weathered beyond his years, will tend to stick a pair of gloves on when handling a Blue Spruce. The tree does have a great smell too, though. 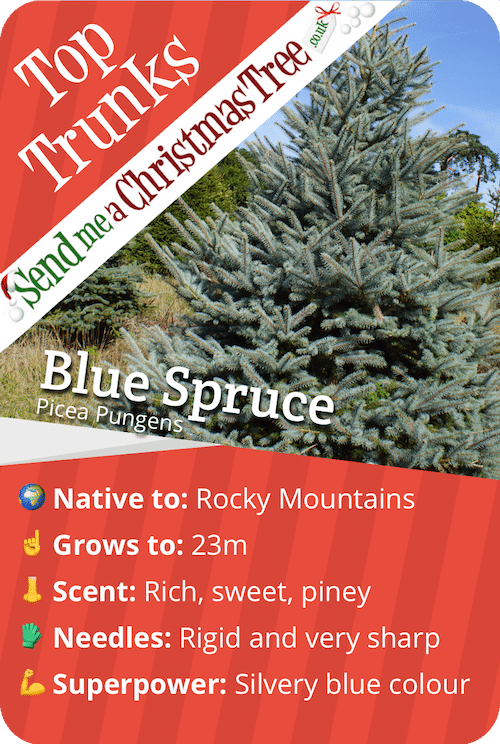 Similar to the Norway Spruce, it’s a piney smell – very fresh and perhaps a touch sweeter than the Norway Spruce. 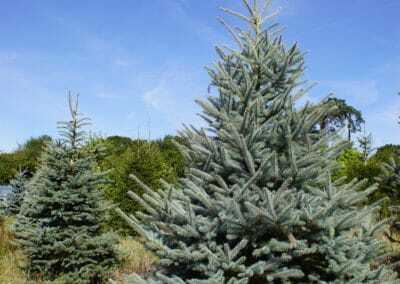 The Blue Spruce is relatively slow-growing and will only reach up to around 23m. It grows in a conical shape, with the strong branches reaching horizontally outward. Identifying a Blue Spruce isn’t too hard – look for the colour and also the thick, sharp, rigid needles. Fresh needles (new growth) will often have a white powdery coating, which gives the trees a silvery appearance from a distance. 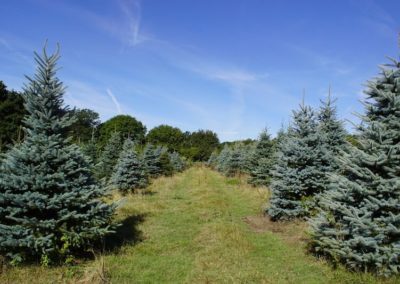 It’s also the reason that the Blue Spruce can appear to be it’s bluest around Spring and Summer, with it being a bit darker green later in the season. 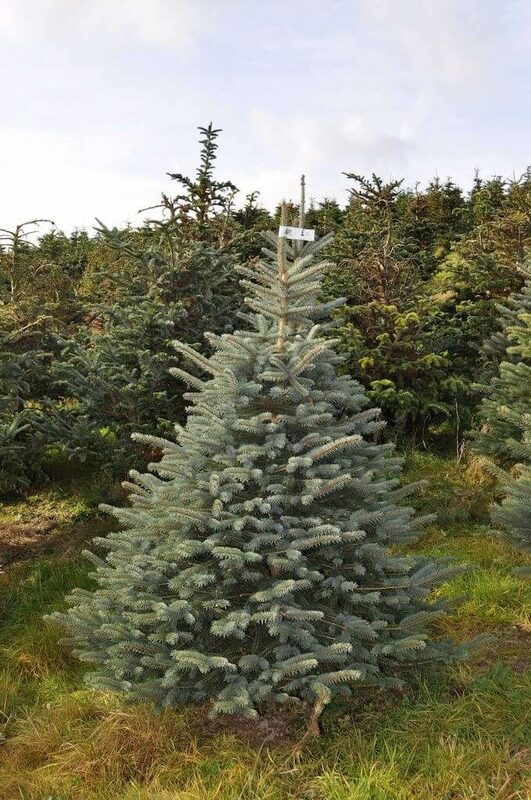 Medium needle retention (better than Norway Spruce, not as good as Nordman Fir). Firm, strong branches (great for hanging decorations on). Because of the sharp needles, it’s not a great choice if you have toddlers about the house. 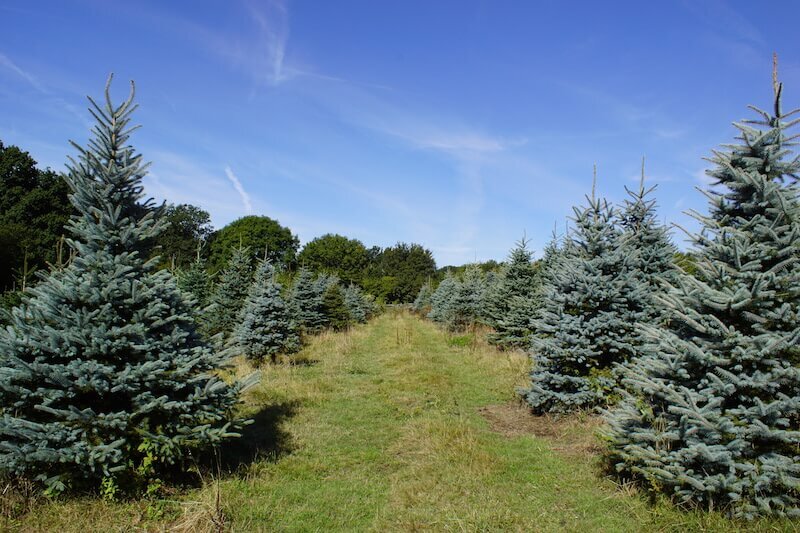 Our fields are full of Blue Spruces waiting to grace your house at Christmas time. 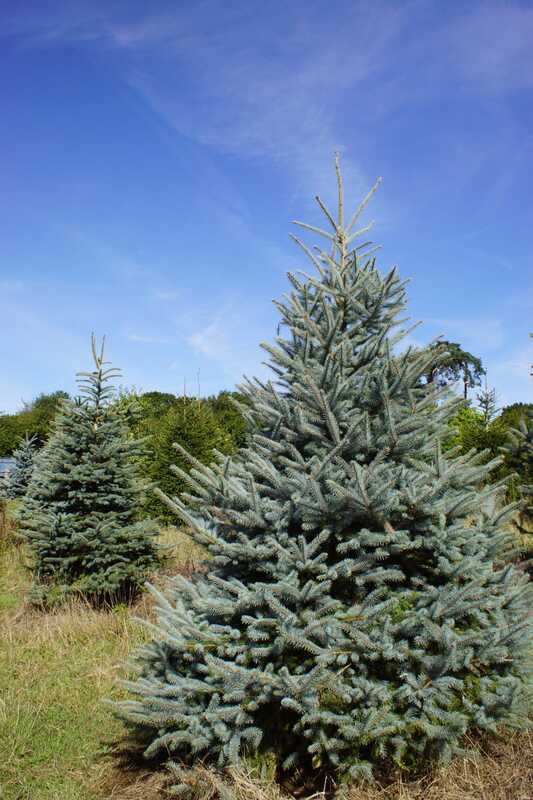 To get a fresh-cut Blue Spruce with free delivery, order today and simply pick the day you want it delivered.